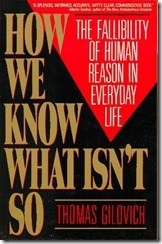 This 1991 book by Thomas Gilovich, subtitled “The Fallibility of Human Reason in Everyday Life”, is very readable and very informative. At the start of the book, he describes how we misperceive and misinterpret the random data that life throws at us constantly. He then describes the social motivations we have for holding questionable beliefs. He gives some detailed examples using “alternative” medicine, and ESP. Finally he suggests ways that we can improve our thinking processes. There were two things that surprised me in this book. First, that the most favourable attitudes towards ESP were found in a survey of Canadian college students – 80% believed in psi! Second, that probabilistic approaches of the social sciences better prepare you to deal with a non-deterministic world.